They have now changed the collection point right inside of the arrival hall. Easy to spot and staff are fluent in English. Recommended! Connect with family and friends and tell them all about the exciting vacation you are having in Thailand without exorbitant roaming costs with an unlimited data SIM card. Enjoy lightning fast web speeds, get updates from your social media accounts and make hassle-free travel arrangements. Available for pick up right when you arrive in Phuket, enjoy 8 days of strong network connections at 4G speeds. Make the best of your vacation in Thailand and enhance your mobile lifestyle! The counter is located in the international terminal, near exit 2/1. in case you come from within Thailand you'll arrive in domestic terminal and you will have to exit domestic terminal and walk to International terminal exit 2. the dtac counter itself is fairly noticable and should be visible once you enter the terminal. the staff were very courteous and helped us set up our phones with new SIM and activate it. if you avail more than 1 SIM, the provider has an offer where calls between the two are completely free. The counter is located in the international terminal, near exit 2/1. in case you come from within Thailand you'll arrive in domestic terminal and you will have to exit domestic terminal and walk to International terminal exit 2. the dtac counter itself is fairly noticable and should be visible once you enter the terminal. the staff were very courteous and helped us set up our phones with new SIM and activate it. if you avail more than 1 SIM, the provider has an offer where calls between the two are completely free. The SIM card offers 3GB of 4G data for 8 days. After you finish using the 3GB, you will still have access to unlimited data usage, but at a pitiful speed of 384kbps. The Happy Tourist SIM also comes preloaded with THB 100 call credits, which is equivalent to around 30 minutes of local talk time. The SIM card comes with Standard, Micro and Nano size adaptors. Klook price is very good. The SIM card offers 3GB of 4G data for 8 days. After you finish using the 3GB, you will still have access to unlimited data usage, but at a pitiful speed of 384kbps. The Happy Tourist SIM also comes preloaded with THB 100 call credits, which is equivalent to around 30 minutes of local talk time. The SIM card comes with Standard, Micro and Nano size adaptors. Klook price is very good. 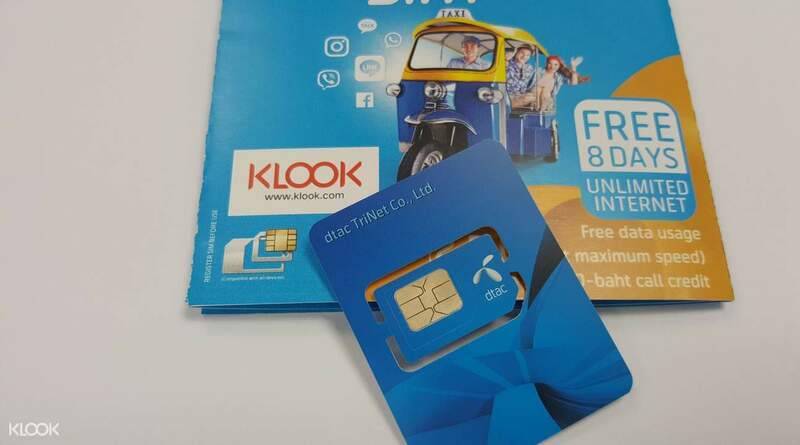 It was easy to find the station for 4G sim card that I bought on Klook. The internet connection was stable and fast. Here were the first photos I shared with my friends right after being connected. It was easy to find the station for 4G sim card that I bought on Klook. The internet connection was stable and fast. Here were the first photos I shared with my friends right after being connected. very helpful, got to post all the photos taken from our tours right away because of the free unlimited internet. very helpful, got to post all the photos taken from our tours right away because of the free unlimited internet. Fast speed internet, if you re a Malaysian, it is definitely faster than 4G at Malaysia. It is value for the money only cost me RM19. Fast speed internet, if you re a Malaysian, it is definitely faster than 4G at Malaysia. It is value for the money only cost me RM19. SIM card worked immediately as soon as I put it in my phone. Signal is stronger than the hotel wifi... highly recommended! SIM card worked immediately as soon as I put it in my phone. Signal is stronger than the hotel wifi... highly recommended!